Hands on a 14 cell refreshable braille display. Text reads "Braille Traille Reader LE Pre-order today! From our start more than 160 years ago, braille has been at the center of what we do. “Braille is necessary for literacy, and is the gateway to independence and employment,” says APH President Craig Meador. 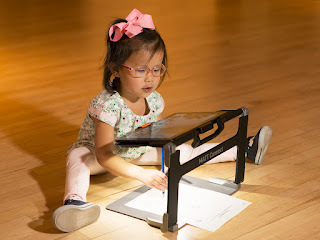 With the continued popularity of refreshable braille, we see a need to start students on their path to literacy by providing them with the high-quality refreshable braille necessary to prepare them for higher-end devices later in life. American Printing House is excited to be adding the Braille Trail Reader LE to its family of refreshable braille displays. This new device is a special, limited edition of HumanWare’s Brailliant BI 14 for teachers and students. The Braille Trail Reader will come with an exclusive file transferring application, making it easy for teachers, parents, or students to load and transfer files to and from the Reader and any Windows device. The Braille Trail Reader is loaded with other features that will prepare students for the more advanced refreshable braille displays they can expect to use later in life. · Cursor routers make for easily editing in the notes app, or opening apps when used with a screen reader. · Silent and almost instantaneous refresh rate. · 8GB of internal memory to store books, notes, etc. · Vibration feedback and/or auditory cues. · Thumb key navigation so your hands never have to come off the braille display. The Braille Trail Reader is brought to you by Braille Bug, an online website from APH dedicated to teaching young people about braille and breaking down stereotypes surrounding people who are blind. In addition to your purchase, you’ll be able to request a complimentary Teacher's Kit that includes a poster, stickers, and braille cards to help educate your class about braille. There will even be downloadable online worksheets that allow sighted children to learn about braille as a “secret code” and online games for the whole class to play! These great resources for families and for teachers in inclusive classrooms will be coming soon. Braille is COOL, and we want everyone to know. Even the small details of the Braille Trail Reader, like its red case, are meant to help braille stand out at home and in the classroom. AVAILABLE ON QUOTA! APH is now taking pre-orders for the Braille Trail Reader LE! Visit https://bit.ly/2FFdgou to order now and ensure you get your reader as soon as they are available in mid-April! 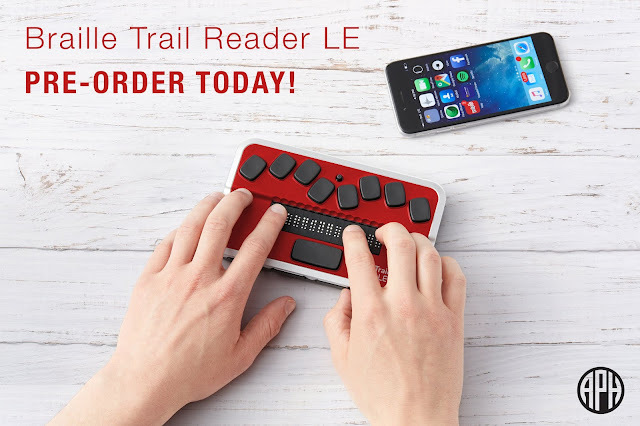 The Braille Trail Reader LE is only available through the end of 2019.